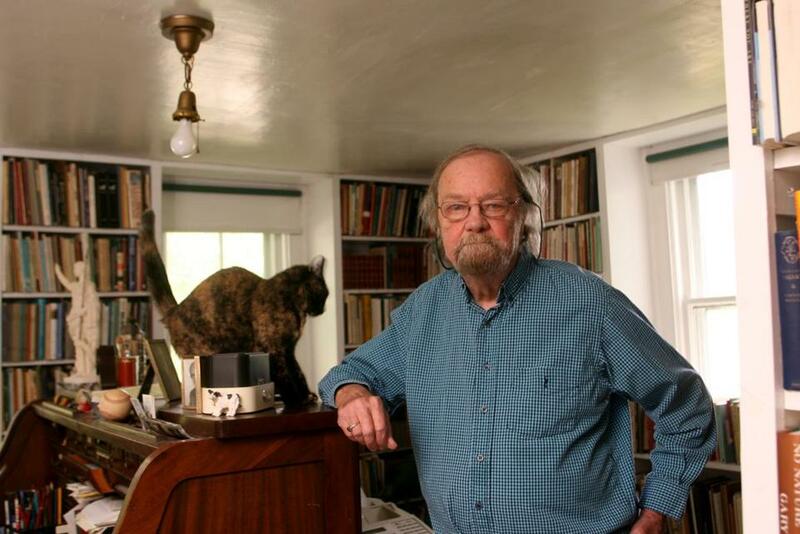 Donald Hall, shown in his childhood home in Wilmot, N.H., in 2006. 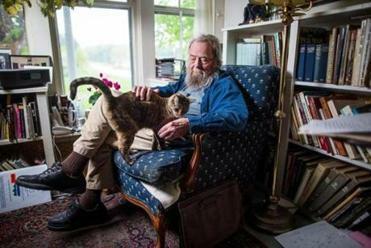 I met Donald Hall in his ancestral farmhouse in Wilmot, N.H., over 40 years ago, when I lived nearby in my own farmhouse. We were introduced by two of his neighbors, former high-school students of mine who knew I wrote poems and thought we should meet. Don was 47 then, an established poet with several books. I, on the other hand, was 34, and had no books at all, and with a family of four children, I had little time even to be a poet. But I did have a manuscript, and after my visit with him, during which I hardly spoke, I sheepishly drew it from my coat, put it on his kitchen table, and got out of there as fast as I could. After I got home, I reviewed my poems trying to imagine Don’s encounter with them, and each seemed less impressive than the one before. But it turned out Don was drawn to them. In a letter I received two days later he wrote, “I am dazzled by your poems.” I carried that letter around with me for days. I may have even slept with it. And in the end, I lost it. But I never lost those six liberating words. They helped carry me through years of expanding my manuscript, failing to place it, and at last publishing it. Don’s letter also led to a correspondence and a friendship that lasted until the end of his life. But when he wrote about the poems I sent him, he was uniformly serious, and the detail of his comments showed me that completing a poem required relentless revision and patience. “Hold the work back for a long time,” he said, “because a poem has a way of changing on its own, before anybody else’s words get into it.” In another letter he said simply, “The writing is what matters.” Not half-baked lines and images, not even the book publication I was hoping for, but true words that stood still and meant what they said. What mattered above all, I understood, was the possibility of art. I gradually learned that Don was engaged in his own struggle with the possibility of art. Just a year earlier, he had given up a tenured professorship at the University of Michigan to relocate to his grandparents’ farmhouse with his new wife, the poet Jane Kenyon, both of them hungry for a fresh start and a chance to focus on their writing. The move inspired work that took Don beyond anything he had written before. His new poems recalled boyhood summers spent among the sheep, horses, and stone walls at the farm, during which he listened to his grandfather recite poetry while milking cows, and each morning watched his grandmother gaze at the beauty of a nearby mountain through her kitchen window. Once a poet of short lines, Don turned to long lines that let him embrace the details of the place and celebrate the connection he felt with Jane there. Along with his tenure as US poet laureate, Mr. Hall was the winner of numerous honors and prizes in poetry, and was a member of the American Academy of Arts and Letters. I remember Don’s excitement when “Kicking the Leaves’’ came out in 1978, and his pleasure as he toured New Hampshire and elsewhere to read from it. The book and his readings resulted in a five-year appointment in 1984 as New Hampshire’s poet laureate. I commemorated that event with a sweatshirt bearing the words “New Hampshire Laureate of Poultry.” Don’s response to his achievement in the new poems? “You’ll never really know whether you’re any good as a poet, and nobody living can tell you either,” he said to me, sitting in his favorite living room chair at the farmhouse. Then he crossed his fingers, and in a comic follow-up, crossed his arms and legs, turning his whole body into a pretzel. Yet the long lines and deep engagement of “Kicking the Leaves’’ gave Don an ambition he had never known before as a poet. Two years after the collection came out he wrote, “You know, I have not written a satisfactory poem — virtually not one poem — since that book . . . But I am working on long and ambitious things, and maybe they will not only be publishable but Immortal. And after all, that is the only thing worth thinking about.” Those poems finally appeared in what may be his most important collection of all, “The One Day,’’ which surveys and denounces the greed and corruption of contemporary life in a range of voices that mix autobiography, history, and prophesy. Published in 1988, the book is more relevant today than ever, predicting the selfishness and depravity of Donald Trump’s America. About five years after “The One Day,’’ Don attempted another broad view of American life titled “The Museum of Clear Ideas,’’ which introduces a speaker he calls Horace Horsecollar. A combination of the old Walt Disney character and a Yankee sage, Horsecollar comments on the anxieties and folly of his age with a cool and witty irony. The detachment of his vision, at odds with the confessional impulse of poems in the 1990s, brought something new and different to American verse. But Don did not forget his old subject of the family farm, going back to it again and again. In “The One Day’’ the farmhouse becomes the counterforce for America’s corruption, a spiritual place where he and Jane spend each day writing poems as they create a third thing: “work’s paradise.” In later books, though, the ravages of time catch up with Don’s vision of Eden. “The Museum of Clear Ideas,’’ written after his brush with cancer and fears of its return, alternately praises “the long white/ house that holds love and work together” and, through the voice of Horsecollar, mocks that view of the farmhouse as narcissistic. When Don reaches his final book of poems, “The Back Chamber,’’ having suffered the indignities of old age and years of grief for Jane, who died of leukemia at 47 in 1995, he describes the farm as a place of “cowbarns gone awry” and broken chairs ready for auction. Don returns to the farm one last time in “Meatloaf,” a poem published in his eighth decade. The narrator is an old man who instructs the dead collagist Kurt Schwitters about baseball, a lifelong obsession for Don. The aging speaker intersperses his meandering conversation with talk about his past life at the farmhouse, W.H. Auden, and a weird recipe he has invented for meatloaf. Just when we suspect the old man might be losing it, we notice that his apparently random thoughts have a pattern, derived from baseball’s nine innings — nine stanzas with nine lines, each in nine syllables. The ups and downs of his life have a pattern, too, though it’s sometimes sideways, with links to, among other things, the uncertain fate of the Red Sox in earlier seasons and a tour of the art museums of Paris. In the end we see Don has adjusted the old poetic materials of his New Hampshire place to create a unique and wonderful poem — a “meatloaf” that resembles a modernist collage in its disparate ingredients. In the process he offers an homage to Schwitters and a celebration of art at the same time. At the end of his poem Don offers a glimpse of himself as he writes “Meatloaf,” revising its lines by “counting nine syllables on fingers/ discolored by old age and felt pens.” Rediscovering him there as I write this tribute, I think of his advice to me 40 years ago about my own revisions, and of his unshakable, lifelong dedication to the possibility of art. I will miss him. Wesley McNair’s currently lives in Maine and has written numerous collections of poetry, including his recent collection, “The Unfastening,’’ published by David R. Godine.